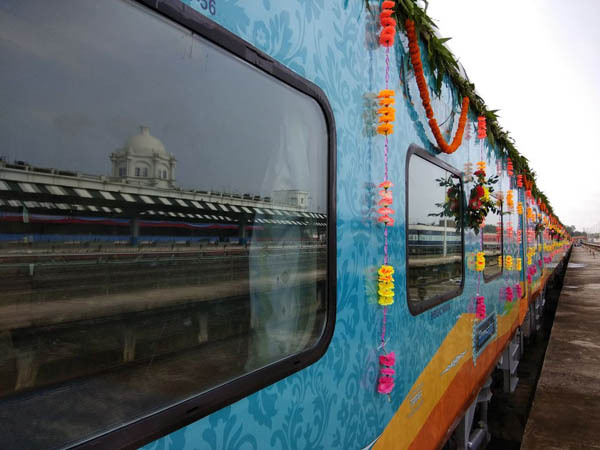 Union Minister of State for Railways Rajen Gohain and Tripura Chief Minister Biplab Kumar Deb on Tuesday flagged off the second Agartala – Bangalore Humsafar Express from Agartala. Luxury train Humsafar Express had started rolling out of Agartala in January, once a week. Northeast Frontier Railway (NFR) extended the service from weekly to bi-weekly with the increasing number of commuters and a request from the state government. Tripura Chief Minister Deb requested the centre to expand the railway network and number of trains for long and short distance for support the developmental initiative of BJP-IPFT government in Tripura. He urged the ministry to speed up the survey work and to start the track laying work in alternative railway line decided to cover Kailashahar, Kamalpur, Khowai and Mohanpur.